Today I woke up to the sound of church bells ringing. It took a few seconds to register in my half-awake brain that I wasn’t back home but in a “very Muslim” country. 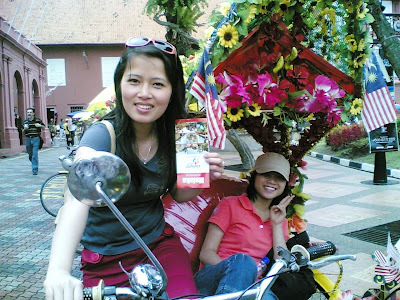 It brought me to a start, the way Malaysia is both so conservative as regards its own beliefs and traditions ---and flexible at the same time, as to the existence of other faiths. This kind of religious tolerance is the stuff of dreams for so many other countries in the world. It amazes me that such a racially and religiously-diverse country (already a nightmarish situation for some)—is in fact, socially and economically sound. After having celebrated only its 50th year as a nation last year, it is enviable indeed—-how far Malaysia has come in this short span of time. 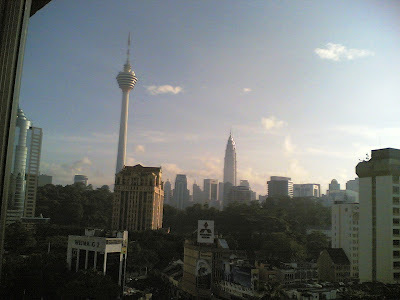 Within 50 years, Malaysia has succeeded not only in building the tallest twin towers in the world but more importantly-- provided free education and healthcare insurance to all its citizens. It was able to provide to its people all the much--coveted basic human needs that my own country, until now, has never achieved. Over a hundred years of nationhood and yet the Philippines continues to lag behind Malaysia, especially in terms of providing the most basic social services to its people. It is this fact I think, from which the contentment and peace in Malaysia springs. Its government has not failed its people. Politics takes a back seat here. It is not the same as the noisy, volatile, chaotic, betrayal-ridden, patron-beholden politics in the Philippines. Politically-charged passion and anger in this country is almost a non-occurrence. And yet democracy is alive and kicking. Malaysians are pretty much able to do whatever they want and live their life the way they please. Their discovery of oil must have done wonders to their economy I suppose. But of course, there are also other important factors that could have contributed to its thriving economy. I may not have the chance to discover them all. I am just thankful that I got this chance to visit this country. Very nice people here (except some rude people in the street). It must be really something to live in a country that your not-too distant ascendants fought tooth and nail for, and even died for. Such is the case of Vietnam. Being so close to two spunky Vietnamese girls these past few weeks have given me a revelation about this country, an awareness that I otherwise would never have discovered. Imagine a communist country where radios play Britney Spears songs? Knowing Cham and Hanh has destroyed all my misconceptions about Vietnam. In my growing alternate point of view, I could see how this country is communist in name only. Not in spirit. Vietnamese people even have divorce for goodness sakes. Look at so-called democratic Philippines! Vietnamese people can do almost anything that Filipinos are allowed to do. Imagine that. And there I was, thinking all along that Vietnam must be one very restrictive, somber, intimidating place to live. They take care of their own. I saw that so obviously in the case of Cham and Hanh. These girls have a forty US dollar daily stipend from their government. At the rate we’re going in the Philippines—this is SO not possible. After all the bloodshed, all the mortal sacrifices, the pain and misery of war— Vietnam has come out on its own—proud and sure of itself as a nation and as a people. This is a country that once defeated a superpower. This is a country that went to hell and back to defend its right to self-determination. This is a country that achieved the impossible with very limited means. Time and again I ask the two, if ever offered a job outside of Vietnam, would they accept? And the answer is a consistent resounding no. Their happiness and pride as Vietnamese is so apparent, you could almost share their joy. In my country, you ask the Filipinos the same question and you know what their answer would be-- and not only that, to leave the Philippines is actually their ultimate dream! But you couldn’t fault them with it too. How tragic. The international community is abuzz about Thaksin Shinawatra’s first ever journey back to Thailand after having been deposed as prime minister in a 2006 coup. Who is this man, that even the most powerful countries in the world would make his homecoming top story? BBC covered his dramatic homecoming extensively, and so did CNN. After having been in exile for 17 months where he also had the chance, of all things—to own one of Britain’s top football teams-- the billionaire businessman was finally hauled directly to court, to face long-overdue graft charges. This only shows how Thailand occupies a very prominent spot in the sphere of international relations. In contrast, the escalating protests and corruption scandal now rocking the Arroyo administration has so far, failed to elicit even the slightest attention from the world’s top news organizations. Right now, even in my own little international circle of friends, nobody just seems to be interested. Everybody knows who Shinawat is. But Arroyo? 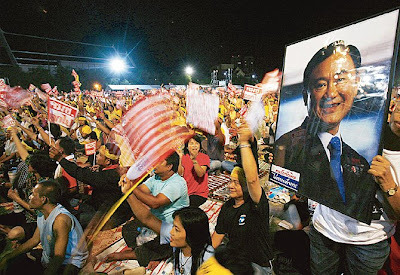 The tragic thing is that, in spite of all the disgrace and defeat surrounding Thailand’s former PM, he’s still considered a person of great significance. In our case, in spite of all the disgrace and dirt surrounding Gloria, foreigners just don’t give a damn and oh wait-- what do you know?! So do Filipinos themselves! Masuwerte talaga ang lola mo! What have we done as a people, to become invisible in the eyes of the world? Why has this nation become a major laughing stock? Why are Filipinos apparently not being taken as seriously as their Asian neighbors, and not being respected the same way? Was it the two, three, or perhaps even four so-called “people powers” where not even a single official spent a day in prison after having been found guilty by the highest court? Was it the hasty pardon, unconditional at that-- granted to a former president-convict, justified brazenly not on the national interest but rather, on the political survival and convenience of one? Or is it the fourteen soldiers, then young and innocent-- who’ve spent their entire lives in jail for an assassination they knew nothing about? Or is it the three-thousand-strong who leave the country’s shores each day, opting to live or work in foreign shores rather than their own? But worst of all is the shame. Shame-- coming from a country that just could not govern itself, much less with integrity and honesty. Shame, being borne of a people with chronic short-term memory loss. Shame for being part of a country that has no self-respect. Shame, coming from a nation with a repetitious history of dishonest leaders and failed institutions. A country that never learns. And now what do we have to contend with? Who do we have to live with? Who is this person whom we allowed, through inaction and neglect, to pursue an unprecedented, incredible greed for power at our expense? Who is this person who now pompously assumes the right to make crucial decisions solely at her own whim? Who is this person who commands mercenaries and thugs-in-uniform, and entire bureaucracies to do her bidding however immoral and unjust-- to conceal the truth by all means?